In the 1930s, teenagers Allen and Buddy Merritt were already key crew members of their father Roy’s famed Caliban fleet, spending winters in Florida and summers in Long Island, and hailed as two of New York’s top charter skippers. In 1948, Roy built Merritt’s Boat and Engine Works in Pompano Beach while Allen and Buddy ran the charter fleet. Eventually as the business evolved from servicing boats to building them, Allen and Buddy took over boatyard operations. But before that, both made their individual marks on sport fishing and became members of the elite group of the most successful tuna captains in history. 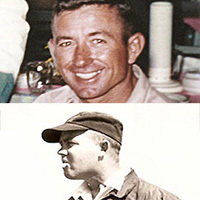 Buddy, extremely competitive by nature, was known for his innovations in boat and tackle design and techniques. In the 1940s he began fishing baits far behind the boat and revolutionized tuna fishing at Cat Cay, Bahamas by becoming the first to use a mast to spot and bait fish. Buddy designed the Merritt 37--widely considered the perfect tuna-fishing boat. He was the first to catch three swordfish on rod and reel in one day. In 1963, he won both the Cat Cay and Bimini Tuna Tournaments; then in 1969 in Newfoundland, he caught a single-day record 16 giant tuna. Meanwhile, Allen went on to dominate the prestigious Cat Cay Tournament in the 1950s and 60s. With Bill Carpenter as angler and George Staros as mate he won seven out of 10 tournaments and took third place three other times-- an unparalleled achievement. Widely respected for his calm demeanor under fire, Allen caught a record 15 giants during the 1968 tuna season in Newfoundland-- a feat only bested by his brother’s 16 the following year.